I bought a bunch of curly kale yesterday, and I made green smoothie (I will post about the beautiful healthy drink later) with small baby leaves and then other big leaves, I made this easy yummy vegetable dish! So, anyway, here is the recipe for you guys! Combine miso and mirin in a small mixing bowl, set aside. Heat a medium skillet over medium heat; add sesame oil, swirl to coat. 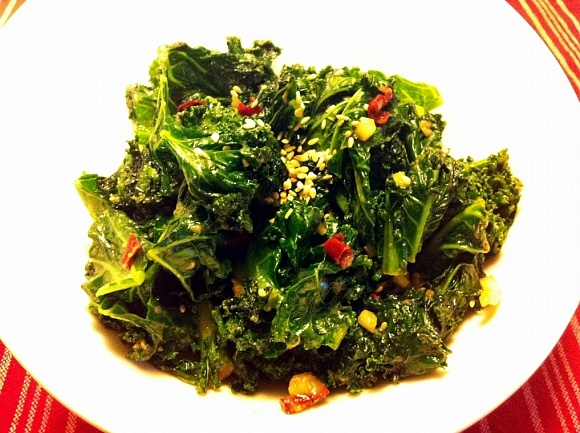 Add garlic, dried chili and kale, cook for a couple minutes until kale is soften. stirring occasionally. Add miso mixture and mix it very well, quickly. Top with sesame seeds and serve warm. Note: Don’t cook more than 1 minutes after you add miso mixture. Otherwise you will lose the beautiful flavor of the miso, which is the main point of the dish. 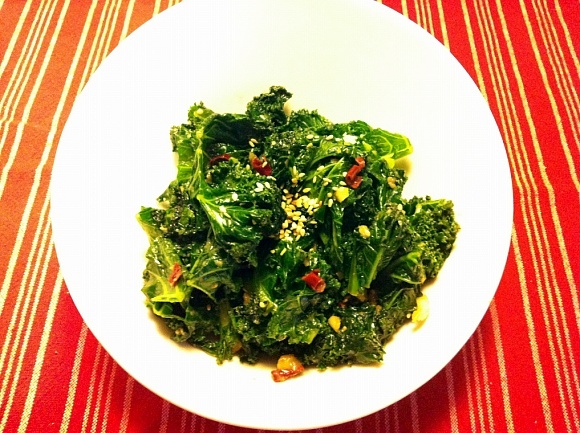 I hope you guys enjoy this easy yummy kale dish!